Samsung today unveiled their new flagship Galaxy S5, Samsung Gear 2 and the Samsung Gear Fit at the Mobile World Congress in Barcelona Spain. All three devices will be released in close to 150 countries on the 11th of April this year. 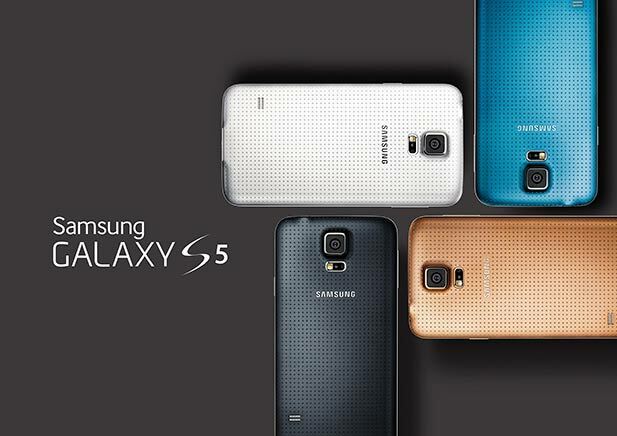 The main improvements on the Galaxy S5 are on the design, the camera, data connection, battery and protection. The design has a perforated back cover that the Samsung officials say it will offer better “natural” grip of the device. The screen is 0.1″ larger than the 5″ on the Galaxy S4 with greater resolution. The camera is an 16MP with improved shutter speeds and shallower depth of field which means users can get more creative with their images, particularly by obscuring out of focus parts of it to make objects stand out. The battery also has some major improvements offering 10 hours of browsing and 12 hours video playback. The battery is also supported by an Ultra power saving feature that give it 3 days of standby, with just 10% power remaining. The Samsung Galaxy S5 also has a finger print scanner, not the eye scanner as most speculated. Lastly, the Samsung Galaxy S5 is water and dust resistant (not proof) with an IP-67 rating. And my S4 is just 3 months old…whack!! I’m almost a few months to getting an upgrade but after reading through some articles I’m inclined to wait for another release and perhaps an immediate Gear 2 buy. I hope they don’t pull the plug on their Accidental Damage Cover plan. And for those who are good in their English language, what is the difference between water/dust resistant and water/dust proof? The guy from Samsung who presented it said the S5 can resists the effects of rain so you can use it whilst raining but it should not be left in still waters for a prolonged period. I think resistant is something that can withstand the effects of water and dust to a point, Proof is something that can withstand the same effects indefinitely. Given the two, the word you place on your product will go a long way in warranty issues and dealing with law suits. DISCLAIMER: My English is not “that” good.